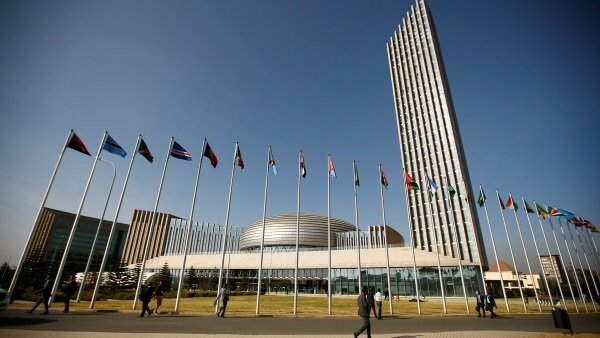 The 32nd Ordinary Session of the Assembly of the Heads of State and Government of the African Union kicking off is kicking of in Addis Ababa starting tomorrow. It will be the first meeting for Minister Abiy Ahmed and he is expected to talk about the ongoing change in Ethiopia, seat of the African Union, according to the Press Secretary in his office, Nigussu Tilahun, as reported by VOA Amharic Service. Nigussu told VOA Amharic that the summit is a good opportunity about the change in Ethiopia and the challenges it is facing. Unique in this year’s summit as far as Ethiopia is concerned is that emperor Haileselassie I statue will be unveiled in the premises of the AU headquarter, which many Ethiopians think is long overdue. Emperor Haileselassie played a crucial role for the establishment of what was then called, Organization of African Union (OAU, now renamed as African Union. One Response to "African Union Heads of State summit kicking off in Addis Ababa"
Here we go, again. The OAU or AU was established fifty-six (56) years ago (1). What did it accomplish other than dropping the letter “O” from the name? Honestly, what did the African Organization accomplish to elevate the dignity, equality, education and standard of living of the ordinary African people? Really, if nothing else, let us be honest to ourselves. Quote:“It will be the first meeting for Minister Abiy Ahmed…” Unquote. I have no quarrel with that fraternal get together as it has always been with our dear Organization of African Union. But, to stretch it and claiming for the benefit of of the ordinary African people is too much of a DECEPTION. Fifty six years – even by African leisurely standard – is a long time [being magnanimous to our Dear Africa]. Quote: “This year African Union will have a new chairman and it is Egypt’s turn now.” Unquote. Hmmmmm….. I can’t help drifting to a time period when the notorious Gaddafee of Libya proposed to change the name of the organization to ‘USA’ >>> United States of Africa!!!. After a deep Intellectual discussion, the meeting agreed to AU. The rest is history, as they say. (1)	A little humour: An African met another African (Ethiopian) abroad and after the usual introduction and shaking hands, the African lamented: “I visited many of our African countries but Ahhhhh……I have never visited your country Ethiopia because, when it comes to your beautiful country with your beautiful women, my Boss would never let anyone to go there except himself” THAT SAYS A VOLUME ABOUT OURSELVES. SMILE, Please.